After decades of hesitation, the business world has embraced climate protection. More companies than ever are taking stock of the environmental impact of their employee travel and working to reduce it. Videoconferencing and more efficient ground transportation are among the more common means. Several organizations last month announced commitments in conjunction with the COP21 United Nations Climate Change Conference in Paris. Royal Philips said it would be carbon-neutral by 2020, in part by cutting energy consumption from logistics and business travel. Unilever’s goal is to be “carbon positive” by 2030. The company would derive all energy consumption for operations from renewable sources, with virtual training in lieu of travel as one component. For many other organizations, business travel remains a footnote in sustainability reports, if it’s mentioned at all. For them, perhaps the global deal worked out at COP21 is a wake-up call. “This is an unprecedented international climate deal and sends a clear and unequivocal signal to the private sector: a global political intention to shift to a low-carbon, and ultimately zero-carbon, future,” according to KPMG. In a 2015 survey, KPMG found that sustainability reporting around the globe is inconsistent. Eighty-two percent of the world’s 250 largest companies report carbon emissions. Half don’t publish reduction targets and among the rest, about one-third explain the targets. Corporate travel emissions reporting is tricky business. It “poses many challenges due to the large number of variables, the difficulty in collecting data from suppliers and increasing uncertainty in the data as the sources become further removed from the company,” according to the 2015 Xerox global citizenship report. The company in 2014 began tracking Scope 3 based on the WRI Scope 3 Accounting Standard. Same at engineering firm CH2M. Bringing expertise to projects around the globe makes travel an “imperative and essential” part of the business and “a difficult metric to shift,” according to company info. Coinciding with the opening of the Paris conference, the White House announced that 154 companies signed the American Business Act on Climate Pledge — more than double from when the initiative was announced in July. They include Bloomberg, CH2M, KPMG, VF and Xerox. For each of the 154, the White House provided some details about commitments. Fewer than 10 of the listings mentioned business travel or corporate fleets. A closer look at these companies’ latest sustainability reports, though, finds several more monitoring, reporting, reducing and mitigating their business travel impact. Microsoft is among those to attain carbon-neutral business travel, partly through offset projects. Goldman Sachs intended to get there in 2015 and stay there. BNY Mellon and Biogen also are among those working toward the goal. There are several ways to attack emissions from employee ground transport. Some push travelers to rail when it makes sense. Bloomberg said that 60 percent of its 2014 travel between New York City and Washington, D.C., was on trains. Between London and both Paris and Brussels it was 97 percent. On the roads, some companies are just starting to track emissions from car rentals. Others, like Wyndham Worldwide’s internal travel program, work with rental companies to offset emissions. Apple, HP, IBM and Autodesk are among those requiring suppliers to offer fuel-efficient vehicles when available. Autodesk by FY2019 aims to reduce rental car emissions by 30 percent versus 2013. In FY2015, it achieved 12 percent. HP claimed that “100 percent” of employee 2014 car rentals were for designated fuel-efficient cars. The company updated its booking tool “to default to compact cars across all regions.” Apple said employees in 2014 drove more than half a million miles in hybrid rentals. That equalled the previous two years combined and cut out 35,000 gallons of gas. Fleet management offers more opportunities beyond the obvious purchasing of fuel-efficient vehicles. HP in 2014 launched a new program to reduce fuel consumption. It called data collection the “first priority, and biggest challenge.” To overcome it, HP in 2015 planned to consolidate with one fuel provider and fuel card system across 23 European countries. The company said it is “on track” to cut global auto fleet emissions 20 percent by 2020 versus 2010. • Genentech intends to use virtual meeting technology to help trim 10 percent from all transportation-related emissions by 2020 (versus 2010). Air travel accounted for 24 percent of the firm’s 2014 greenhouse gas gases. • Qualcomm in 2014 upped to 42 its number of telepresence rooms and last year planned to convert 26 existing videoconferencing rooms to telepresence facilities. • By the end of 2014, Intel had 250 video collaboration rooms in 30 countries around the world. • Novartis mentioned “significant progress” in 2014 travel cost-cutting. It decreased those global expenses by 23 percent, “primarily” through virtual meetings. • Ikea in May 2014 began a “Let’s Go Virtual” awareness campaign. In FY2015 it had 18,000 virtual meeting participants using videoconferencing facilities across 265 company sites — all added in the past five years. • EMC installed 50 TelePresence facilities around the globe. Employees also have been using a lot more desktop videoconferencing. The company said EMEA travel costs last year fell by 7 percent year over year after installing remote conferencing systems there in 2013. • HP increased remote conferencing tools by 300 percent in 2014 from 2013. That helped cut commercial air travel emissions by about 23 percent. Meanwhile, HP also is working on hotels. It flags for travelers those properties meeting certain environmental standards. The company said 69 percent of its 2014 room nights were at top-performing properties. Ikea reported that it reduced from 20 to four the number of companies used to “plan and book travel arrangements.” That will help make carbon data collection more accurate. The company in FY2015 also started reporting a new metric: travel costs as a percentage of yearly sales. It was 0.39 percent in FY2014 and 0.41 percent in FY2015. The goal is 0.35 percent by 2020. 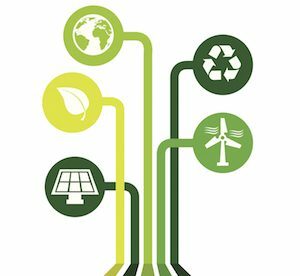 At KPMG, member firms pitch voluntary carbon neutrality in tenders. An emissions calculator helps engagement teams measure and offset emissions from travel, lodging and other areas. Meanwhile, KPMG member firms work with conference venues on environmentally sustainable events and meetings. Many other companies’ meeting management programs take similar steps. Autodesk trains meeting planners and includes sustainability questions and expectations in standard meeting contracts. Water tech company Xylem aims to go paperless for “at least 50 percent of events, conferences and meetings.” That goal is part of a “green office” checklist the company had tested and sought to roll out in 2015. Travel suppliers joining the White House pledge include Airbnb, American Express, InterContinental Hotels Group and MGM Resorts. JetBlue is the only airline participant. The aviation sector isn’t addressed in the final COP21 agreement (though it was in early drafts). That apparently surprised the aviation sector. The Air Transport Action Group figured there wasn’t enough time for a compromise. “The International Civil Aviation Organization already has its own mandate and well-established program for further addressing aviation and climate change, without the need for direction from COP21 or the UNFCCC,” according to the group. But ATAG did say COP21 added momentum to the cause. Aviation is aiming for carbon neutrality by 2020. That’s a tall order, given that the U.S. government only last year acknowledged airplanes are bad for the environment. ICAO aims to finalize a mandatory global offsetting scheme during its September 2016 assembly. The Global Business Travel Association through March 14 is collecting applications for its Project Icarus sustainability awards.